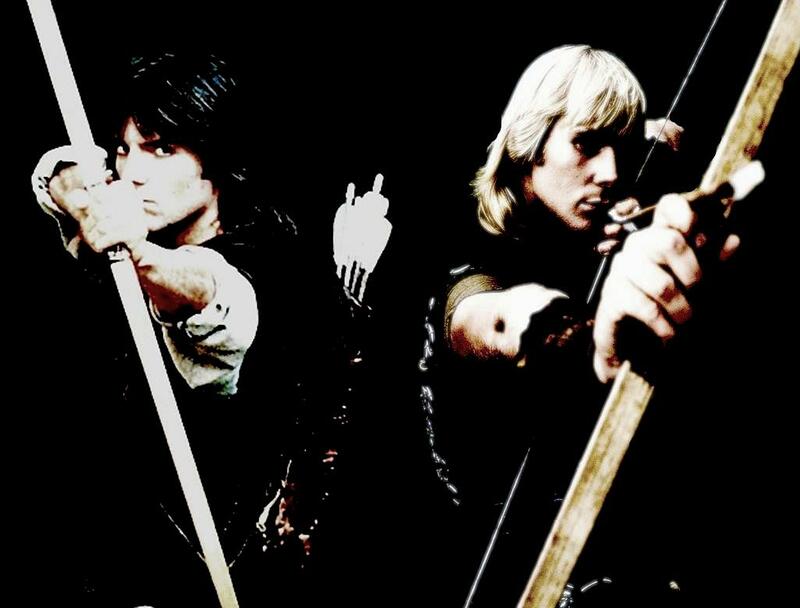 The Robin of Sherwood series has always had a huge influence on me. I took up tournament archery, did local re-enactments and learned swordcraft while listened constantly to Clannad. Yes I'm a R.O.S. fan of the most memorable series ever created. Even now nearly 30 years on...I'm still watching the DVD's, with my son...how sad am I? My wife went on set in Cardiff and met, Nicholas Grace and others filming series 3...and she's not even a big fan...no life's not fair. Still facinated by the Medieval period: peasants, dragons, scorcery. Oh I'm an artist and writer by the way. Longbow: I'm 6' 2" so a 72" English longbow is perfect for my height...which is nice. I'm standing in the inner circle Avebury, in the poring rain before the Midsummer/Solstice Pagan ceremony shoulder to shoulder with Herne, The Avebury (Pagan) Stag. I turned to him and had to admit that my pagan name is, thehoodedman (sorry guys it's been my chosen name for many years) and I'd waited 30 years for this moment. You can't begin to imagine what I felt like...well perhaps you here probably can? LOL, ah those days are gone...I like the memories but I've moved on, not really me anymore...perhaps a wig? Sounds like you have a great Steampunk scene your way...I envy you that. Could Definitely do his current look...scarily similar! gulp! Steampunk, eh? Well yes it does seem to be popular. There's a big enthusiasm for it here in Lincoln. They're always knocking about town in their corsets and goggles every other Saturday! You look like you made an awesome Michael Praed 'homage' though. Come on, you know you miss the hair! If you promise to go as Michael, I'll do my best Connery Jr impersonation!! i'm doing fine thanks, i went back to college in september i'm doing a diploma in irish history, i'm also in drama school but i had to leave for a few months to do my college course.they play sounds .....interseting......;-) when are you doing the play? i went for an open casting tuesday the irish actor gaberil byrne is doing a picture here and the movie company were looking for actors and it;'s PAID WORK so i'm hoping they call me. ;-) can't beleive xmas is almost here,the year has gone by way toooooo fast. I know- it seems so far off doesn't it? And cheap it ain't either. I'm seriously considering it though. Been a huge fan for so long and I've missed out on a few RoS conventions before. We'll see what happens, �130 might not be felt so much in two years' time. Will you grow your hair back for it? yes, that would seem to be the case. He does say on the RoS DVD extras interview that he got absolutely slaughtered in that Broadway production (I think it was the Three Musketeers! ), poor chap. In a way, it was a good thing that he left or we probably would never have had the genius that was 'the Greatest Enemy'. It probably was that episode above all others that struck an emotional chord with audiences. Anyway, like I said; I was 8- my perception of what happened is somewhat different now, but sometimes you just can't shake off old feelings!! Jason forever!!! You going to Chepstow, Paul? Mandy Doll! so glad to hear from you...was it really August we last spoke? I'm rehearsing for the Christmas Play, for the 'Avebury Players' I'm a dastardly French Showman ( with a ridiculous large part...no I better rephrase that...a lot to remember...no that's even worse!) with an outrageous French accent, a moustache and a big red hat. hey havn't been on here in a while how are you keeping? hey guys- do forgive this terrible intrusion, but I had to wade in here and drop in my 10 pence's worth! As an 8 or 9 year old at the time, I was terribly offended (and somewhat betrayed) when I saw my beloved Robin appear in Dynasty. At the time, my young mind assumed he'd left the awesome show that was RoS for the... erm... NOT awesome show that was Dynasty.... and I've just never been able to forgive Mr Praed (even though the truth of his departure was probably somewhat different to my naive understanding)! When Jason took over, I loved him immediately for the difficult task he was faced with (as both the character and the actor) and I've just never looked back. Jason for me!! He had it a lot tougher and didn't walk away! god that's mad .i said i wouldn't watch the jason ones either but i did just to see what it was like.............. NO WHERE NEAR MICHAEL'S ONE.clannad's music was amazing wasn't it. i have seen them lots of times. i love them. i also have the michael robin of sherwood on dvds there great. everytime i watch them i feel like i'm 15 years old again werid i know but it's just how i feel. michael praed is without a doubt my fav robin OF ALL TIME. there will never be another robin for me. what about you? I bought a 'square-foot' of Sherwood Forest about 6 years ago to help preserve it, like many here I suspect?